We need your special help right now, more than ever. All year, we have run at a deficit, clearly caused by Hurricane Katrina. Although New Orleans is 4,000 miles from our mission outpost, our income from gifts dropped considerably in September of last year following that terrible disaster. Since July of this year, we’ve sunk $109,432.10 into red ink. This perilous shortfall is partly due to a drop in contributions, and partly due to a doubling of fuel-related expenses, such as electrical power for our transmitter. We can’t ask anyone not to give to people who have lost their homes. But would you please consider handing this newsletter to a friend who might be interested in helping our work? And please continue to pray for us. That is the greatest gift of all. SECOND GENERATION: (left) Meet Tara Schmidt, 16, daughter of KNOMers Ric and Lynette Schmidt. Alone at home one day, Tara grew bored and wound up as a guest voice during her dad’s daily radio show. Before long, she became interested in deejaying, and for several weeks held down a two-hour shift. She is KNOM’s first 2nd generation volunteer. Tara is a busy young woman. She earns money as a dog walker, she’s helping plan the junior prom, she’s active at St. Joseph parish, in youth court and JROTC, and is a competitive runner. Yay, Tara! OUR WORK: KNOM brings the Mass and Rosary to 150,000 square miles of road-less village Alaska. These serve not just the homebound, but also people in places which see a priest only rarely. We broadcast educational and inspirational spots, much like commercials, but with important messages. We battle this region’s alcoholism, domestic violence, child sexual abuse, suicide and accidental deaths, rates which are the highest in the United States. This oldest Catholic radio station in the country remains strong on the air, thanks to the kindness of good people like you. INSPIRATIONAL SPOT: You don’t have to be great to start something, but you have to start something in order to be great. INSPIRATIONAL SPOT: Our faith should be our steering wheel, not our spare tire. 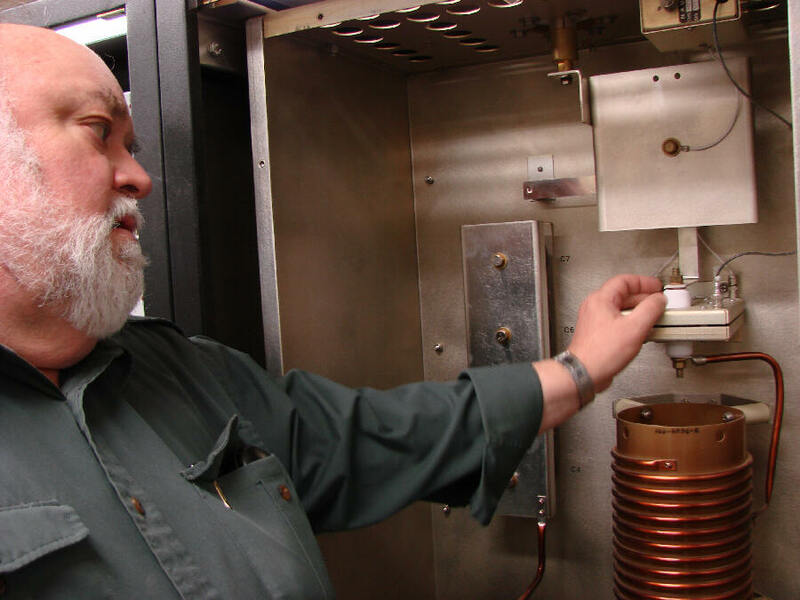 REALLY COOL: (left) With power off, engineer Les Brown checks the transmitter’s output for heat, a sign of trouble. It was fine. Last month, Les flew up from Palmer, Alaska, and Tom Busch from Anchorage, to give the transmitter its annual thorough checkup. A 1973-4 KNOM volunteer, Les later served as chief engineer on a reduced salary between 1997 and 2003. YOUR PRAYERS ARE REQUESTED for office assistant Robyn Woyte, who is bedridden in a hospital in Anchorage, expecting her third child, Sophie. (Left) Robyn with her two children, Steve and Gracie. Sophie is small for her gestational age, but she will have to be taken by Caesarean section fairly soon, as Robyn is at risk due to diabetes and high blood pressure. Doctors are postponing surgery as long as they can, but they can’t wait much longer. Meanwhile, the wheels are in motion for Robin’s husband, Major John Woyte, to return a month early from duty in Iraq. 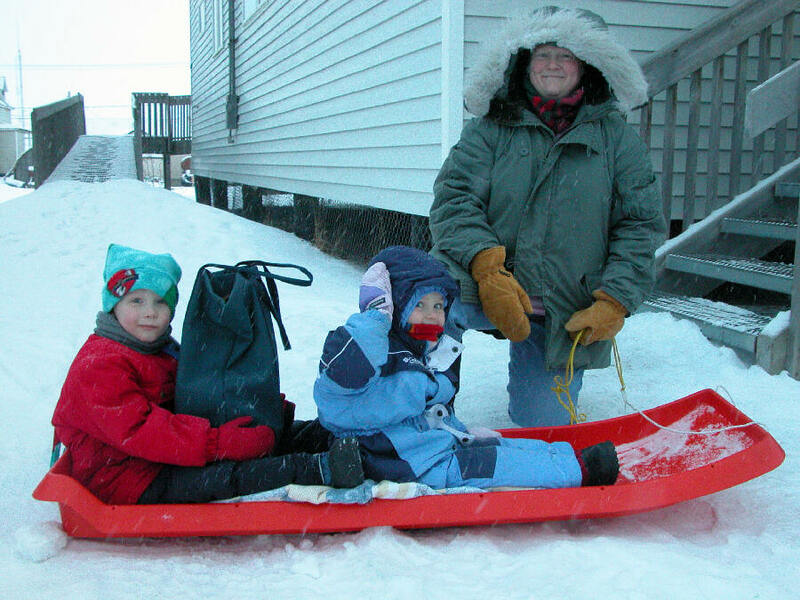 Robyn’s mom is in Nome tending to the couple’s other two kids, with lots of help from KNOMers. Robyn says that she greatly appreciates any prayers you can offer on her family’s behalf. 31,200: That’s how many inspirational spots KNOM has broadcast so far during 2006. 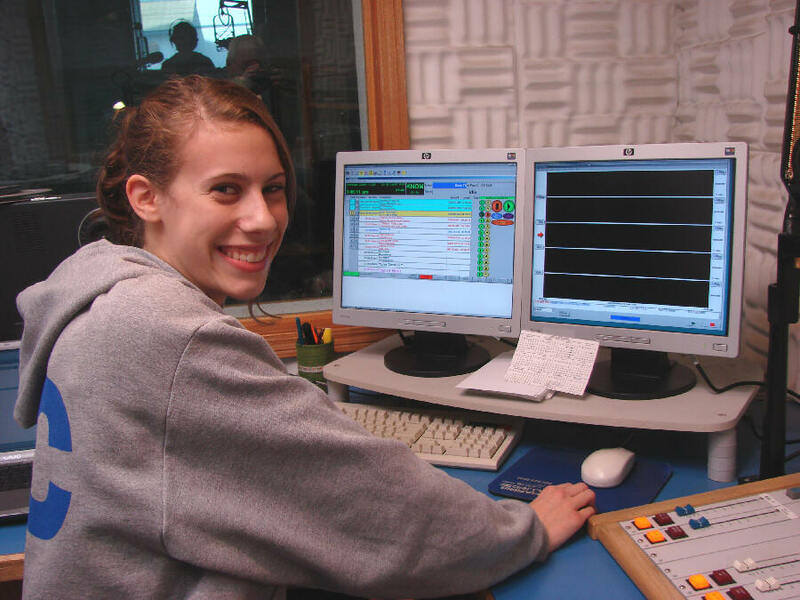 31,200: That’s how many educational spots KNOM has broadcast so far during 2006.
and many more. It’s an effective way of teaching. Thank you for making these important “mini-programs” possible. One minute at a time, they are helping people to make constructive changes in their lives. Since 1971, KNOM has brought Catholic programming, information, news, inspiration, encouragement, companionship and positive entertainment to isolated Eskimo and Indian village families. Our only source of income is contributions by people like you. Thank you! He has no feet but our feet to lead others in His way. He has no help but our help to lead them to His side. BLOW, GABRIEL, BLOW! In Los Angeles October 20th, KNOM general manager Ric Schmidt humbly accepted KNOM’s fourteenth Gabriel “Radio Station of the Year” Award. It is among broadcasting’s highest national honors, and we are in heady company. Past honorees include WNYC New York City, KNX Los Angeles, KMOX St. Louis, KDKA Pittsburgh, KGO San Francisco and WMAL Washington, DC. 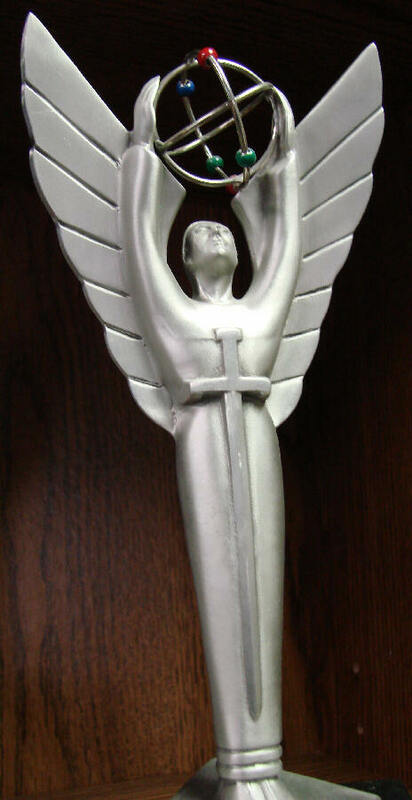 It’s given by the Catholic Academy of Communications Arts Professionals. Yes, for our mission station, this is number fourteen! In his brief speech, Ric honored the hard working and dedicated staff, but emphasized the importance of each of our contributors, who together in gift and prayer keep our mission station alive. With sincere appreciation for your vital support, we hope that you will feel that you own a genuine share of this major award. Thank you! ELECTRIFYING: (left) Here’s September’s power bill for KNOM’s AM transmitter, and ($1,947.11) for the studio building. 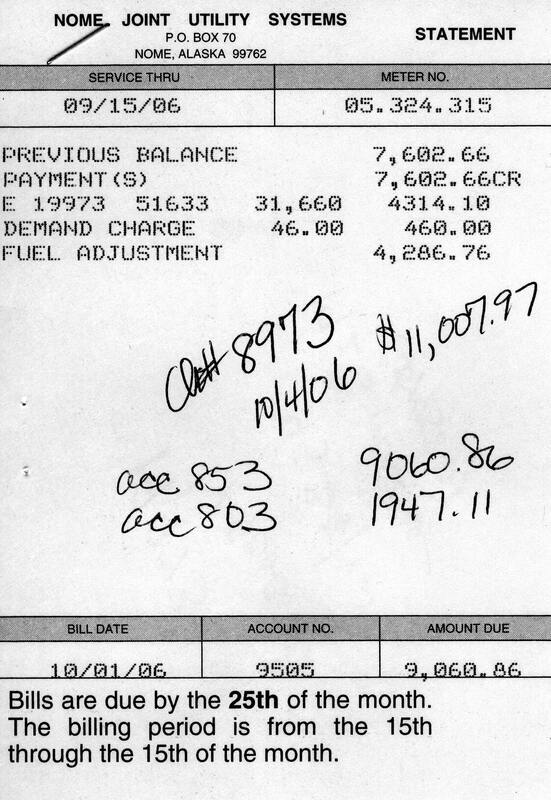 Nome’s electricity is produced by diesel generators, and the skyrocketing cost of fuel has more than doubled prices. Because of these increases, everything in our isolated town costs more. During the same period last year, the transmitter’s power cost $4,291.60. You can see why we’re hurting! WILLFULLY: Please consider adding the KNOM mission to your will. Prayerfully, we place all bequests into funds that are used only to meet emergencies such as our current crisis and provide for major future improvements. May God embrace those whose final gifts are helping to keep us on the air at this moment! INSPIRATIONAL SPOT: Lord, not my will be done, but Yours. IT’S A RECORD! (left) KNOM volunteer Ross Reilly sits with the largest music donation to the station in our 35-year history. 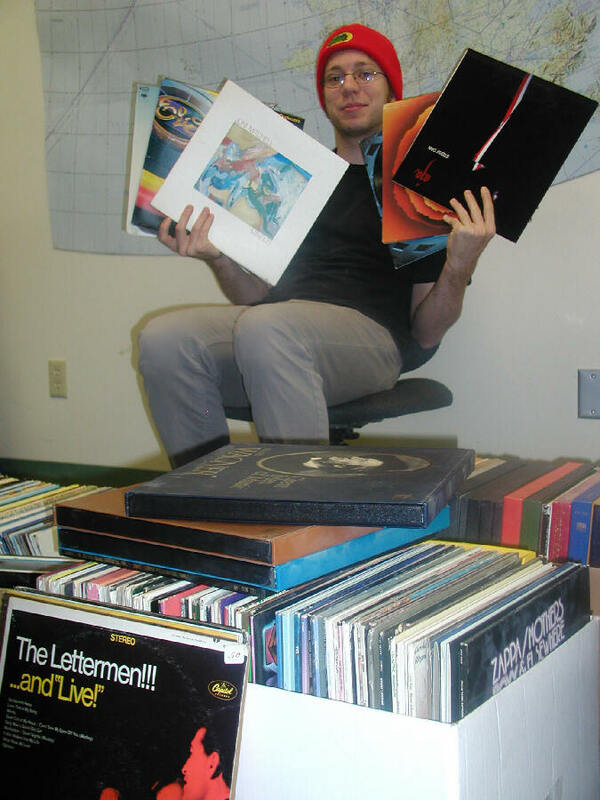 A long-time Nome resident was moving out of town, and gave KNOM 1,600 LP records! Ross was poring through them, searching for material we don’t already have. Many people of Ross’ age have never seen a vinyl record, but as luck would have it, Ross is an avid collector of them. THIRTY YEARS AGO: In November 1976, the ocean was in the process of freezing. KNOM volunteer news director Steve Havilland reported that two walrus, separated from their herd, were spotted a mile off shore. Steve described a “mad house” rush of hunters and boats, but there was no getting through the ice and the animals drifted off to the west. FORTY YEARS AGO: In early winter 1966, thanks to a $15,000 grant from the Society for the Propagation of the Faith, the budding Catholic Nome radio project had $30,000 in the bank, about 20% what was needed to construct the station. APPLY TOPICALLY: Ahead of the November election, KNOM produced interviews and call-in programs with Alaska’s three main gubernatorial candidates. For most of our listeners, it was their only way to become informed of the candidates’ views on rural Alaskan issues. It was an active month. Once more, we thank you deeply for joining us in offering this greatly needed radio service. If they could, our faithful listeners would thank you, too. Please stay with us, and know that you remain in all of our daily prayers. May Our Lord reward you abundantly for your generosity.